Paramount Pictures and New Regency Productions jointly announced today that Academy Award nominated director Darren Aronofsky will direct the feature film Noah, with Academy Award nominated screenwriter John Logan (Gladiator, The Aviator) coming aboard to re-write the script by Aronofsky & Ari Handel. Aronofsky and Scott Franklin will produce the movie. “Since I was a kid, I have been moved and inspired by the story of Noah and his family’s journey. The imaginations of countless generations have sparked to this epic story of faith. It’s my hope that I can present a window into Noah’s passion and perseverance for the silver screen,” said Aronofsky. When it comes to putting the Bible on film Hollywood’s record is mixed. There are the enduring Ten Commandments, Ben Hur, The Passion of The Christ and there are the completely forgettable like The Nativity Story, with its decidedly un-grace-filled Virgin, and others that I have, well, forgotten. So one greets the concept of a film about Noah, with a certain jaundice. Is Hollywood capable of forgoing its cynicism to treat a saint like Noah, “a preacher of rigtheousness” (2 Pter 2:5), without without “cutting him down to size”? 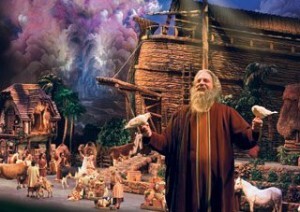 Besides, the story of Noah has more than mere human drama. It is humanity’s first encounter since the Garden with global divine justice. Can people so sure they own themselves begin to approach a story that is predicated upon the concept that God owns us and may dispose of us as he wills? “As were the days of Noah” Jesus says, will be the final judgement (Matt 24: 37). Can Hollywood look unblinkingly at a God who judges, and the fearsome consequences of that judgement, without judging Him by their own standard of political correctness? In Crossing the Threshold of Hope, Blessed John Paul II responded to this “theodicy” question, this tendency of human beings to attempt to judge God. And he said that God’s response to this human attempt to judge Him was to come to earth and place Himself completely at the mercy of human judgement and thereby demonstrate for all time our abject inablity to judge Him. Ultimately then any real encounter with Noah’s faith is an encounter at some level with the Cross. Everyone involved should probably read the second chapter of 2 Peter before they touch it. And we should pray for them.